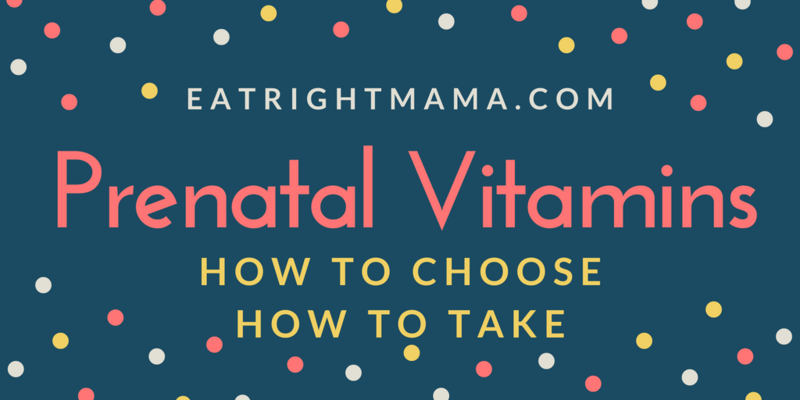 You’ve read my previous post in the series, Do You Really Need a Prenatal Vitamin–check! You want to know how to pick the best prenatal vitamin for you–check! In the U.S., what goes into nutrition supplements isn’t regulated—that means you need to be a savvy shopper. Most prenatals have a similar lineup of nutrients—you’ll see all the B vitamins, C, D, iron, zinc and folic acid. Some brands provide different formulations of iron or calcium to improve absorption or tolerance. Other vitamins contain stool softeners; some have nutrients that you haven’t even heard of! Choline is necessary for the development of the memory center of the brain and has also shown to help folic acid prevent birth defects. Most women don’t get enough. Food sources include eggs, beef, scallops, salmon, chicken breast, wheat germ. (Liver is actually the best source, but I’m not a fan of it during pregnancy.) Read everything you want to know about choline here. Iodine is what you find in your salt when it says “iodized”. Sea salt may or may not have it–same goes for the salt that’s in processed foods. Iodine is critical for brain development because it’s needed to make thyroid hormones. A deficiency during pregnancy or early childhood can cause mental retardation. Vitamin D: Daily Value-600 IU. Note that the amount in most prenatal vitamins may not be enough, especially if you don’t get much unprotected sun time. I recommend you have your serum Vitamin D tested to find out if you need more than that. Vitamin D is not only important for yours and baby’s strong bones, it’s also needed for neuromuscular and immune function. DHA: 200-300 mg; this is often in a separate gel cap. This isn’t necessary if you eat 8-12 oz of seafood a week including an omega-3 rich source like salmon. They don’t have exactly the amounts listed above but overall they provide more of the nutrients above than other brands. I also like these choices because they stick to close to 100% of the DV for most nutrients. Other vitamins on the market may contain 400% of the Daily Value of some nutrients. Similac Prenatal Vitamins contains lutein, important for brain and eye development. It also contains fish oil from sardines and other fish. Enfamil Expecta doesn’t contain lutein, but does contain choline. It contains a vegan source of DHA. 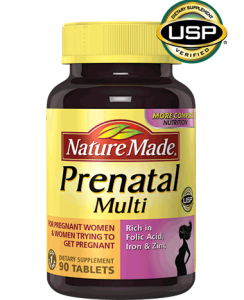 NatureMade Prenatal Multi is a solid brand that contains no gluten, added color, preservatives or artificial flavors. AND it contains 150 mcg of iodine. Take a separate DHA if you choose this brand. 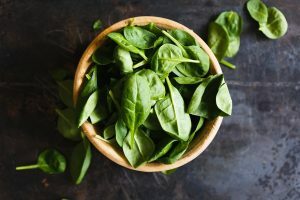 What about Iron–Is More Better? Health organizations like the WHO and the CDC recommend pregnant women take 30 mg of iron daily. Health Canada recommends 16-20 mg daily. As you may know if you’ve taken iron before, it can cause some GI side effects like upset stomach, constipation or diarrhea. An amount more than that recommended by your country’s health experts should only be on the advice of your doctor. Some women do need more if they have iron deficiency anemia–which is linked to low birth weight and other problems for baby. Most prenatals don’t contain much calcium. (1,000 mg is what’s recommended during pregnancy.) If they did, you really wouldn’t be able to swallow them! You can definitely get the calcium you need from food (milk, yogurt, collard greens, tofu, kale, blackstrap molasses) but if you don’t have at least 3 of servings of the foods listed here, you may need more calcium then you’ll find in a prenatal. Find more info on calcium for vegans here. Caution when going “green.” Some have herbal additions such as red raspberry leaf, which is considered “likely safe” during pregnancy but is controversial to use during the first trimester. Check the labels to know exactly what you’re buying—and research their safety during pregnancy. Cutting edge but limited research shows the benefits of other nutrients during pregnancy. You might find these in some high-end prenatals. Discuss with your health care provider. CoQ-10: In one study, CoQ-10 was shown to decrease the risk of preeclampsia in women at risk. The Natural Medicines Database rates Co-Q10 as “possibly safe” during pregnancy, due to limited clinical evidence. Inositol: May help prevent folate resistant neural tube defects. Animal studies also show that folate resistant birth defects are linked to reduced levels of inositol. Inositol is often recommended for infertility. However, right now there is insufficient safety information to recommend it during pregnancy. Take it on an empty stomach—the iron is best absorbed this way. If it doesn’t go down well first thing in the morning, take it before bed. If that doesn’t work, have it with a light snack (but not a calcium-rich food—because that can decrease the amount of iron you absorb.) In the end, it’s not as important WHEN you take but that you DO take it! If you can’t tolerate a prenatal vitamin pill, ask your health care provider about chewable or liquid vitamins. Some health care providers recommend one or two chewable children’s vitamin as a last resort—but keep in mind they might not have everything a regular prenatal has. You can supplement your folic acid by eating a fortified cereal. If you do find yourself eating many fortified foods (cereals, snack bars, vitamin waters), take a moment and calculate just how much of each nutrient you are consuming. If several servings of fortified foods per day are the norm for you, it might be wise to cut back on your multivitamin—perhaps taking it every other day—or on the fortified foods. Hard to swallow? Try gummy, liquid, or chewable prenatals. If that’s what it takes to get your vitamin down, then go for it! Read the nutrient labels carefully, though, as different brands contain different ingredients—some nutrients may be missing, while others could be excessive. Check out Part Three in the series, where you’ll learn what individual nutrition supplements you might need. Must read: Do You Really Need a Prenatal Vitamin?